Successful farmer in field of wheat. An adult male demonstrates a product made of wheat, bread. Harvest time. 4k00:13Portrait of the Caucasian grey haired old man in a hat looking at the side, then turning his head and smiling to the camera. At the wheat field. 4k00:13Portrait shot of the Caucasian agricultural businessman in a hat thinking about something and touching his chin in the middle of the harvesting field. 4k00:12Businessman Negation Hand Sign Made by a Ranch Sober Farmer Denying Gesture. 4k00:19Harvester combine pours the grain into the truck on the field. Threshing machine pouring the just harvested wheat into a silo. 4k00:16Happy adult farmer smiling at camera holding sausages in hands with herd of cows in cowshed on farm. Agriculture industry, farming, people and animal husbandry concept. Manual job and people in farm. hd00:10Mature Couple -- embrace overlooking river. Beautiful couple of seniors near water. Old happy people holding hands outdoors. Togetherness between aged people. hd00:31Man driving a combine and harvesting the wheat. 4k00:19Senior farmer inspecting quality of corn and working with a smartphone. 4k00:23Successful farmer in field of wheat. 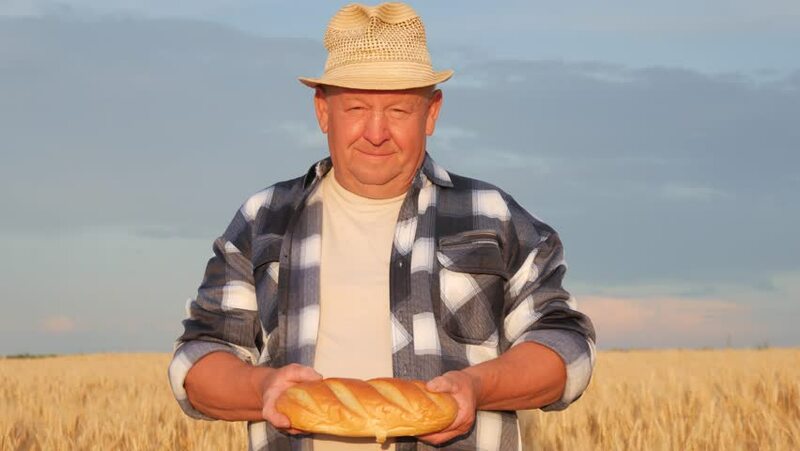 An adult male demonstrates a product made of wheat, bread. Harvest time. 4k00:18Adult farmer with portable tablet computer in wheat field at sunset using specialized app. Modern farming concept, advanced technology in agriculture. 4k00:17A man touches the crack on the front window, he considers the cost of repairs.